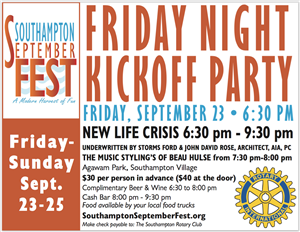 Southampton Rotary Club will kick-off SeptemberFest weekend with a cocktail party in Agawam Park featuring live music and dancing to one of the East End’s favorite bands, NEW LIFE CRISIS, plus the music stylings of Beau Hulse. Complimentary beer and wine from 6:30 to 8:00 pm followed by a cash bar from 8:00 to 9:30 pm. Food trucks will be on site providing refreshments. Always a great party, funds raised will support the Southampton SeptemberFest activities and the Rotary’s Scholarship Program which provides college scholarships to local Southampton students. Music generously underwritten by Storms Motors & John David Rose, Architect, P.C., AIA​.